Remove the tire of the bicycle. This is not difficult at all. You can view a lever there. Just pull it and it will loosen the tire. Pull the tire out now. Remove the rubber tube from the rim. If there is any plastic coating around it, remove it as well. Now disassemble the spokes that are broken. Take both the pieces and go to the nearest hardware store. Get a replacement for the spokes. Ensure that the new spokes are of same size and type. Fix the new spokes in the holes through the central hub. Direction of the spoke should be towards the hole at the other end. 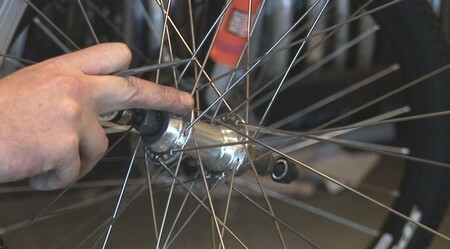 If you are not sure that how to adjust it, watch the pattern in which other spokes are fixed. Insert the new spokes according to that pattern. Take the nut and tighten it on the spoke. The tightness of this new spoke should be same as that of the other spoke. This will create a balance within the rim. Nut should be tight enough to achieve the proper tension in the newly bought spokes. Cover the tire around the rim and attach it again with the bicycle. Insert the inner tube properly in the tire. Now adjust the tire on the rim. You just need a lever to adjust it until the whole tire is adjusted properly. Fill air in the tire tube and your bicycle is ready to ride on. These steps are quite simple and anyone can fix the spokes even if he doesn’t know anything about technical things. It’s always a good habit that you should not throw away the broken parts of the bicycle. They can help you in future when you need to buy the replacements for them. You just need to go to the shop and show them the affected part. They will see the type and will provide with a new set of parts. In this way you can save time and can save yourself from confusion too. Thus it is always better to keep even the broken parts.